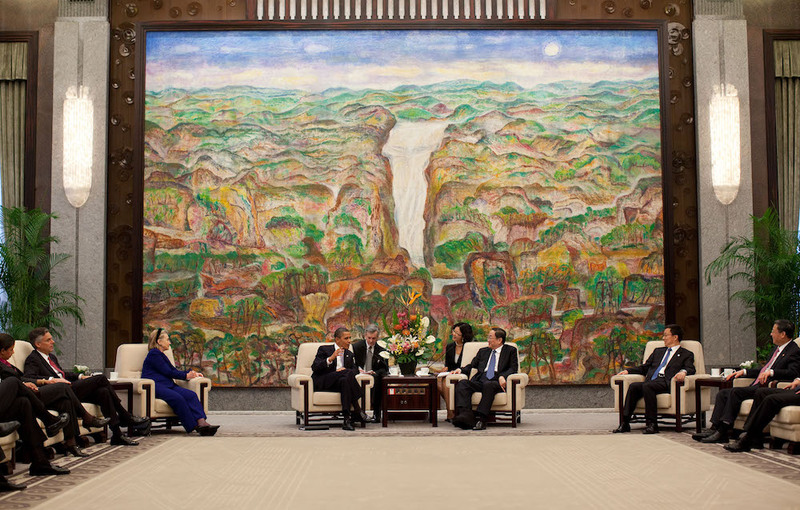 President Barack Obama meeting with a Chinese official on climate talks in 2009. Photo courtesy of Pete Souza/the Official White House Archives. The two of us have been participants and observers for decades as California extended its environmental leadership. In the process, we’ve learned that environmental leadership is not merely a matter of officials setting the right policies. It requires time, firsthand experience with the difficulties of pollution, and, most of all, a public that is willing to try new things in service of the environment. The spirit of Californians is at the heart of any explanation of our state’s commitment to advanced policies on the environment and climate change. California has been a progressive state from its inception, willing and able to push boundary after boundary. Its citizens, from the state’s very beginnings in the wake of the Gold Rush of 1849, recognized few limits. It was California that initiated direct democracy, with enactment of the initiative, referendum, and recall in statewide elections in the early 1900s. And citizen action has produced big changes—protection of the coastline through the creation of the California Coastal Act, a ban on new nuclear power plants, the recall of Gray Davis after rolling electricity blackouts and sky-high electricity prices, and more recently, a refusal to roll back stringent climate change regulation. Californians have a special quality—they are willing to try things themselves, to be adventuresome in policy in ways that other parts of the United States aren’t. Nowhere has this California progressivism been more dominant than in the areas of environment and energy. In the early 1950s, Cal Tech professor Arie Haagen-Smit discovered that the smog choking Southern California was not created by a poison gas attack from Asia (which was what the public widely suspected), but from California auto emissions. In 1959 the state authorized air quality and motor vehicle standards. In 1967, the U.S. Congress passed the federal Clean Air Act, which set national environmental standards. Because the only statewide clean air laws that already existed were in California, and they were more stringent than the new federal legislation, the federal act gave waiver authority to California, allowing it to adopt tougher standards than those set nationally. Furthermore, any other state could select to follow either federal air standards, or California’s. Today, 14 states adhere to California’s air standards rather than the federal rules. On the energy front, California was the first in the nation to decide that energy efficiency must be effectively deployed before construction of any new power plants. After that, the California Public Utilities Commission determined that renewable energy, such as solar and wind plants, should be strongly encouraged over conventional gas-fired power plants. These policy commitments resulted in actions that changed the state’s energy and pollution status quo. 50 percent of California energy use will be renewable by 2030. Today Californians buy one out of every two electric vehicles sold in the United States. The nation’s largest electric car assembly factory, owned by Tesla, is in the state (and the batteries for the vehicles are made just across the state line in Nevada). Under Governor Arnold Schwarzenegger, the state embarked upon a program to install one million solar rooftops—far and away the most in the nation—and has exceeded this goal, with no end in sight. And in 2006 California adopted the nation’s first economy-wide program to reduce greenhouse gas emissions, the Global Warming Solutions Act. All of these programs—renewables, energy efficiency, electric vehicles, solar homes, and cap-and-trade—were firsts in the nation and stamped California as an undisputed environmental and energy leader, not only in the United States, but worldwide. They helped give rise to many international efforts, some led by Governors Brown and Schwarzenegger. Arnold Schwarzenegger founded and continues to lead the R20, helping regions worldwide develop and finance low-carbon infrastructure. Governor Brown started the Under2 Coalition, under which 40 percent of the world’s economy has committed to greenhouse gas reduction goals. He is hosting a global action climate conference in San Francisco in September 2018. But while California is a big state, it represents only a tiny piece of the world, in both area and population. And it is not its own nation. So it can’t continue to beat larger and more important places, especially if China decides to seriously tackle climate change. China is seizing the baton from California, and that’s a good thing, because the country’s scale and phenomenal growth give it the heft to lead the climate fight. In 2015, California had the world’s sixth-largest economy, but ranked 20th in greenhouse gas (GHG) emission, largely because of its clean power mix and energy efficiency emphasis. To compare, the United States ranked first in GNP, and second in GHG emissions. And China? The giant country ranked second in GNP—and first by far in GHG emissions. Simply making its economy more efficient at turning fuel into GNP could lead to lower emissions worldwide. California, with its characteristic spirit, has nurtured this Chinese leadership. China also shares some qualities with California; its people have deep firsthand experience with the dangers of pollution, particularly fouled air and water. And the country has evidenced a spirited desire to lead in multiple areas. That’s why China has quickly equaled California (and in some cases surpassed the state) in combating climate change. China is now the world’s largest market by far for new automobiles and trucks, and shortly will be the largest for sales of electric vehicles. Early in 2018, it announced it was about to stop producing more than 500 car models that do not meet its air quality standards, thus reducing greenhouse gas emissions. China is the world’s largest builder and seller of solar collectors, both at home and abroad, and already has installed far more solar power generation than the United States has. Most solar collectors sold in the United States are made in China and their price reductions have greatly stimulated our nation’s rooftop businesses. China also recently announced it is creating an economy-wide cap-and-trade system, which would dwarf what California and a few other like-minded states and Canadian provinces have developed. All this is happening at a speed that is fast making China the world`s dominant country in the effort to reduce greenhouse gases. California, with its characteristic spirit, has nurtured this Chinese leadership. Over the past two decades, California scientists, engineers, researchers, and policymakers have reached out to other nations, and China in particular, to impart the state’s knowledge and experience. This has led to working relationships worldwide in the effort to curb adverse climate change and to support programs springing from the UN Conference of Parties 21 (COP) assembly in Paris in late 2015 and its aftermath. All this doesn’t mean California can stop. It should continue to develop innovative technology and ever more forward-thinking policies on climate. The state should continue to be a case study, explaining both the positive results and unexpected pitfalls it found while piloting new ways. This allows others to do a fast follow to improve, as well as emulate, the state’s successes. But even at its best, measured by impact and results, California will be taking a back seat to China. California also labors under a handicap. The goals and policies of the current administration in Washington assure that our nation is a non-player in fighting the greatest environmental threat facing earth. Also, our nation is isolated by its plan to withdraw from the Paris climate change accord. This explains why it’s important that California stand apart from the federal government. The state will intensify its climate change mitigation efforts, create new adaptation policies, address resilience issues, and continue to provide the leadership for others. Such steps can limit, but not totally offset, the damage now being done to our planet by the current U.S. administration. Diane Wittenberg founded The Climate Registry and is Chair of the California State Parks Commission. Michael Peevey served as President of the California Public Utilities Commission for 12 years. They are co-authors of California Goes Green: A Roadmap to Climate Leadership.